john4jack (Corvallis, Oregon, United States) on 3 December 2013 in Transportation and Portfolio. This wagon wheel was propped up against the courtyard wall at the church. Lovely grains in the wood that exaggerate it's age. I wonder how old it is? That looks to have seen a few miles . .
Well chosen image section and lovely warm tone-on-tone color palette. This one speaks to me, it says hard manual work, and years of well honed skills. You hardly hear these phrases these days! Gorgeous light, great rendering of textures & colors. Beautiful textures captured under such warm sunlight!! A fine composition with excellent detail and textures. so so beautiful frame, colors, lights, textures & details! Made in Far west ! 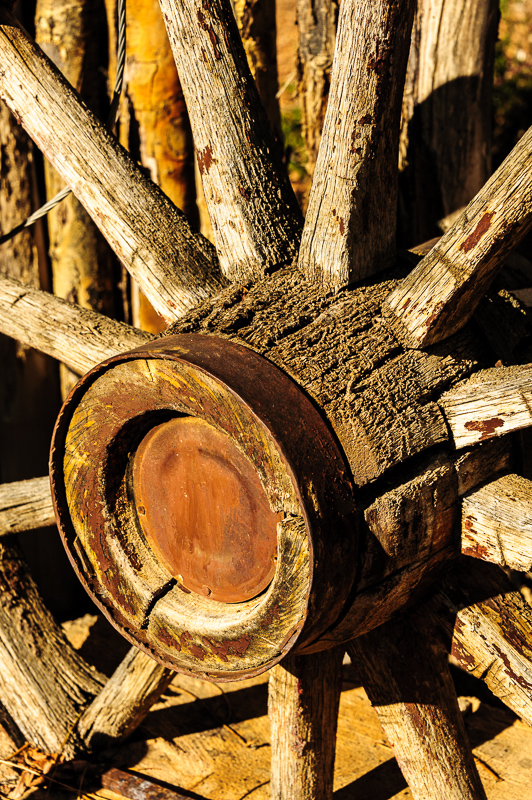 Can you imagine jacking up your wagon and changing that wheel? Excellent shot!!! Fantastic colours and textures and classic clarity!!! love the texture of the old wood and the warm tones ! Lovely & Amazing frame! Bravo!